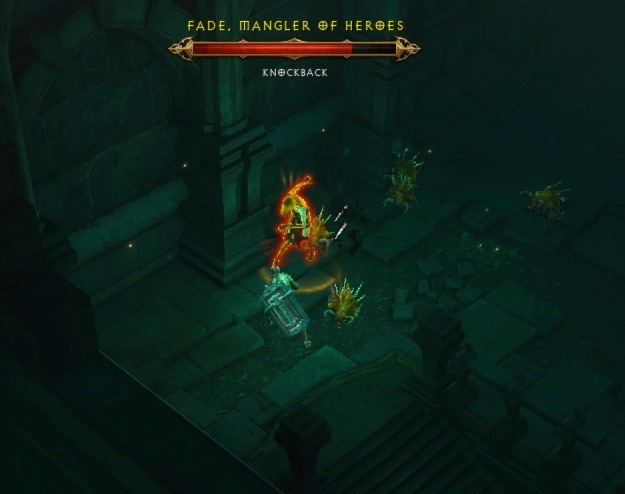 This is part of my ongoing series of blogs where I review my progress through the Diablo III: Reaper of Souls beta. I’ve been taking things slow, in part so that I would have the opportunity to really think about the game. I’m playing a female Crusader that I named Joan. She hit Level 9 at 2:50 a.m. on December 13, 2013. Things got a little weird once she hit Level 9. 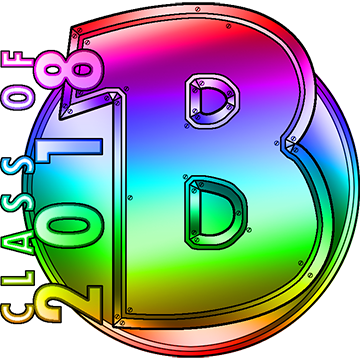 All of the screenshots that are used in this blog were taken on December 13, 2013. When I left off, Joan the Crusader was working her way through the Crypts in the Cemetery of the Forsaken. She was on her way to completing the quest “A Shattered Crown”. 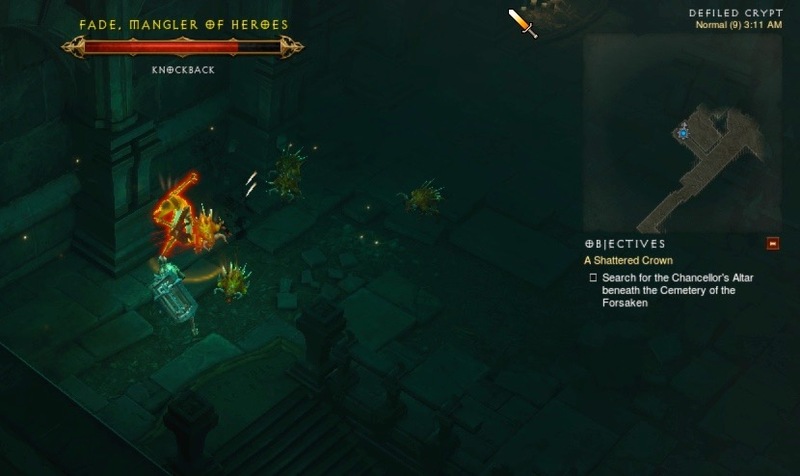 That’s the quest where you need to find the correct Crypt, fight the Chancellor, pick up the crown, and bring it back to Haedrig in New Tristram. It’s also the quest that gives you character a portal. Joan followed a zombie up the stairs, and was fully prepared for battle. But then, something odd happened. Look closely at where Joan the Crusader is standing. Somehow, there was an invisible wall there. She couldn’t move past that point. The rest of the room may as well have not existed. I’d never had this happen before! The monsters, however, had no such barrier. They were able to cross the entire room and come through the invisible wall to attack Joan. I figured that this had to be a bug. 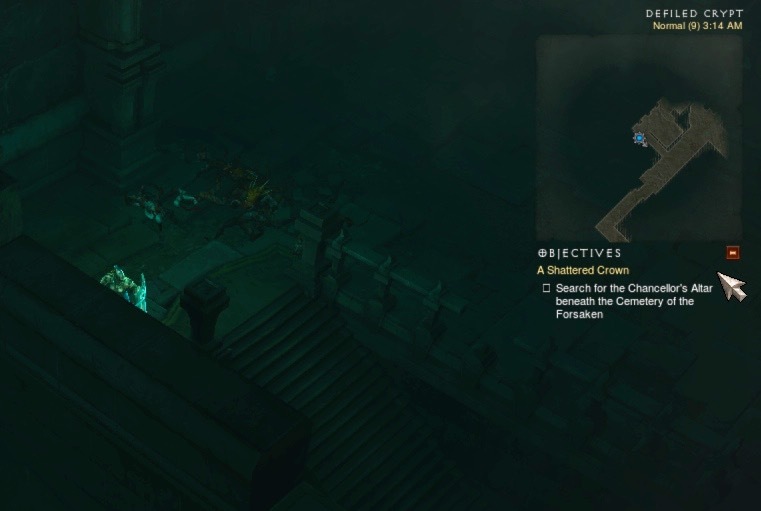 It was the first bug I’d encountered in the Diablo III: Reaper of Souls (RoS) game. In some ways, I found this to be amusing. It can be fun to see something go wonky in a beta. I also looked at this as a opportunity to “do my job” as a beta tester and report the bug as soon as I had a chance to do so. (Which I did after I logged out). I came across this group of monsters at 3:10 a.m. (on December 18, 2013). At 3:12, Joan was still fighting them. My hope was that killing all the monsters would somehow remove the invisible wall that I was stuck behind. It didn’t. I quickly learned that the invisible wall had moved back, causing Joan the Crusader to get stuck in a very narrow strip of space in the corner of the room. Another invisible wall blocked her from being able to go back down the stairs. I killed the monsters, hit all the buttons, and was still stuck. 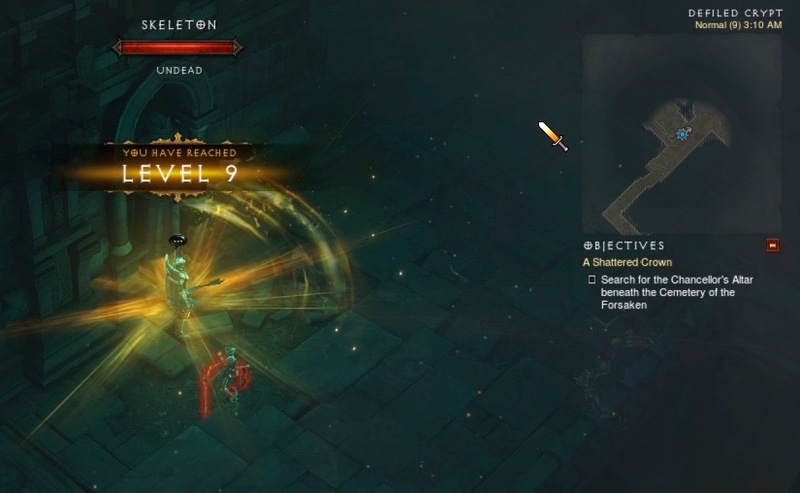 In the back of my mind, I was wondering what a person who was completely new to playing Diablo III would do in this situation. Of course! Why didn’t I think to use the portal? That solution seemed so obvious. I looked for it in the bar at the bottom of the screen…. and immediately realized the problem. 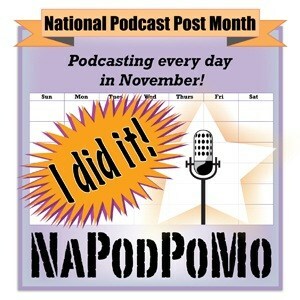 I didn’t think to use it because I hadn’t gotten the portal yet! Joan the Crusader was working her way towards finding the crown – the crown that, ya know, unlocks the portal for players. Right. Now, I’m not blaming the (surprisingly) helpful people in General Chat who gave me advice. They didn’t know that I hadn’t gotten the portal yet. I didn’t specifically mention it, and they just assumed that I had a portal. Even so, I couldn’t help but wonder what a brand new player would be thinking if this happened after RoS went “live”. I bet he or she would be rather frustrated! (That’s why we are doing the beta – to find bugs that need to be fixed). So, how did Joan the Crusader escape from her invisible prison? It involved the use of an entirely different button. Yep, I had to log out of the game in order to get around the “invisible wall” bug. Or, to be more accurate, I had to shut down my computer to get out of the game, and doing so caused me to log out. I took this opportunity to take a screenshot of Joan the Crusader, in all her Level 9 glory. It was getting late/early, but I decided it was worth it to log back into the game anyway. Where would Joan end up? Would she still be stuck in the Crypt? The answer was that Joan the Crusader was back in New Tristram. Ok, that makes sense. 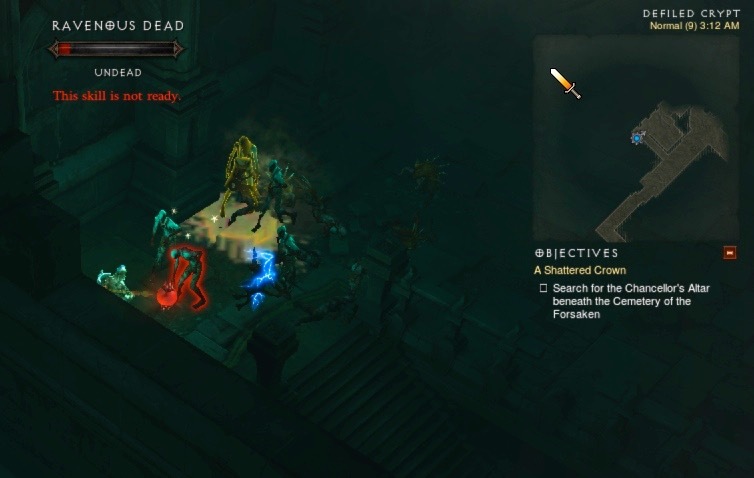 If I remember correctly, the original Diablo III game will put a player who logged out in a dungeon back in the nearest town when he or she logs back in. So, ok, New Tristram, that works for me. The odd thing was that there was an open portal waiting for her. She had yet to earn her own portal, so… the game made one for her? Convenient! 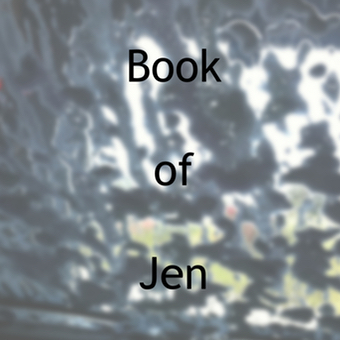 Joan happily jumped into the portal, which took her back to the Cemetery of the Forsaken. She was immediately surrounded by a bunch of skeletons (where weren’t the least bit happy to see her). This is when I realized that the game reset when I had to log out. In other words, I’d lost all the progress I’d made through that zone. I can see where this would frustrate a new player. It’s good I reported this bug. 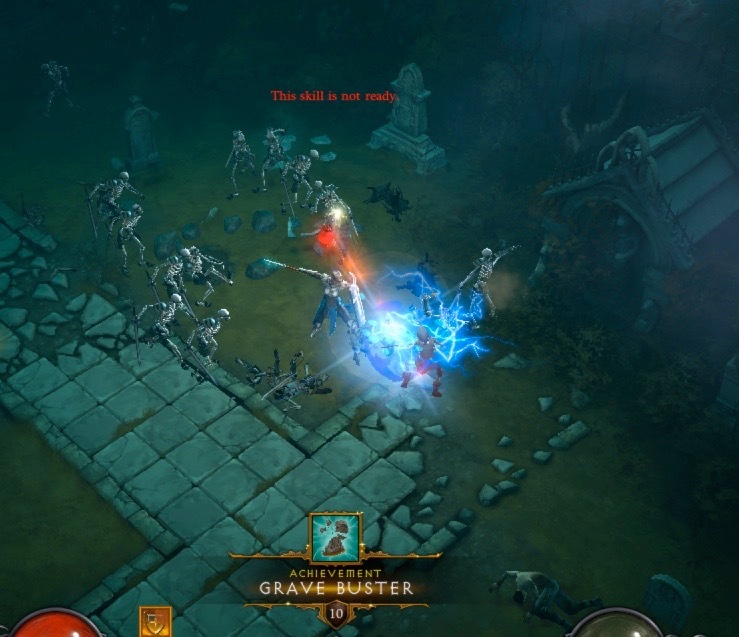 Hopefully, it won’t appear in the released version of Diablo III RoS. As for me, the Cemetery of the Forsaken is one of my favorite locations in the game. I didn’t mind having to go through it all over again. That was an easy one! Onward, through the Crypts! 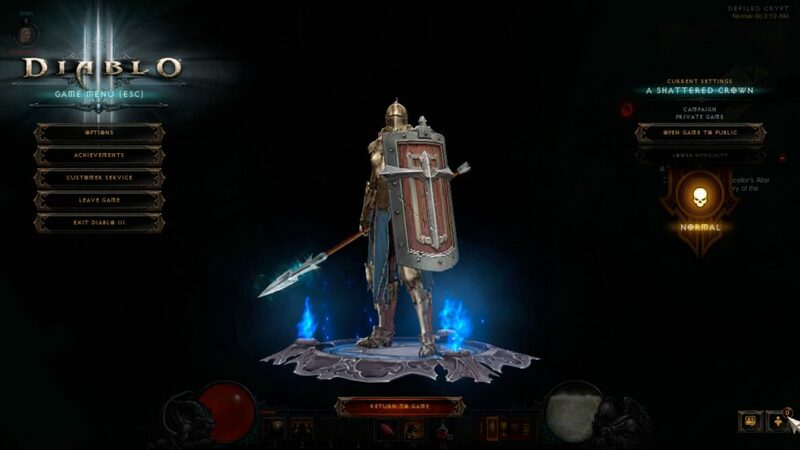 Joan the Crusader fought Manglemaw (the big monster who crashes through the wall like the Kool-Aid Man) at 3:40 a.m. I’ve been through this part of the game in the original Diablo III so many times, that I joke about it now. 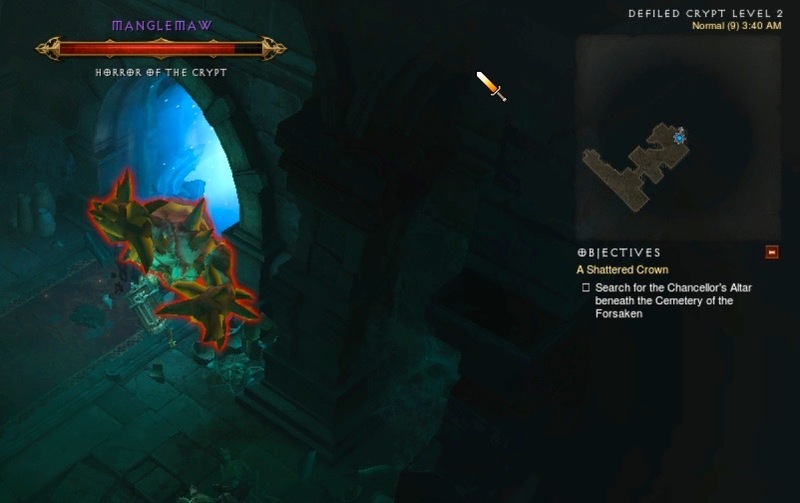 The first time I came across Manglemaw, though, was in the Diablo III beta – and it was actually scary! I was very impressed. Joan the Crusader hit Level 10 at 3:40 a.m. on December 13, 2013. She hit Level 9 at 2:50 a.m., so it looks like it took about 50 minutes to go from 9 to 10. Now, I’m not sure how much time was spent “stuck in the corner”, or exactly how long it took for my computer to restart so I could log back into the game. In other words, I’ve got no way of knowing, for certain, how long it took Joan to go from Level 9 to Level 10. 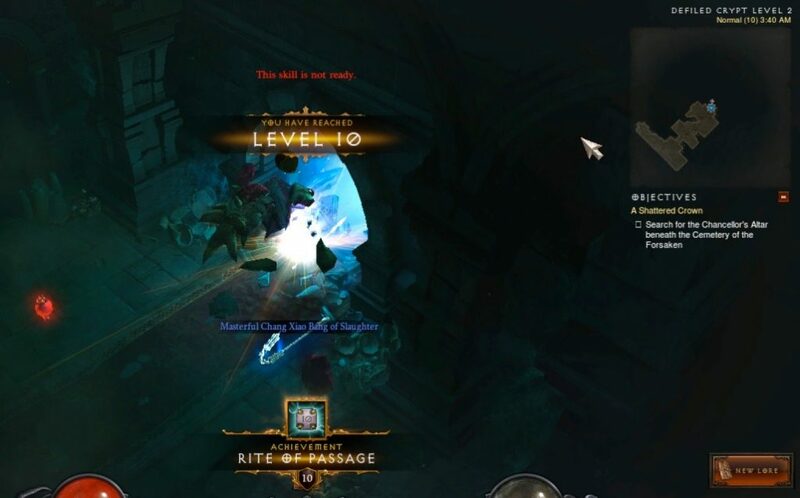 My next Diablo III: Reaper of Souls beta blog will pick up with Joan the Crusader’s adventure through Level 10. Previous Flight Rising: Theme Week – Deities!